Branding at the bottom of the slide introduces people to the site. One of our favorite posts on the GBW Blog is The Snippet Strategy. The idea is that you create blog posts on your website. It’s content you own. It’s content that can work for you for a long time. And from this blog content you can create endless amounts of snippets that you can share on your social media profiles. For example, if you create a that includes 10 Things You Can’t Live Without This Year you could share one of the items with a link to the post on your social profile. It’s a little snippet of information that makes it enticing to get people back to your blog. Your social followers get value from the snippet and they get even more if they visit your blog. We use the strategy in a variety of ways including one way that you might not think about right away. A couple years ago I wanted to test something. Back in 2011, I hadn’t called this The Snippet Strategy, but it’s what I was doing. 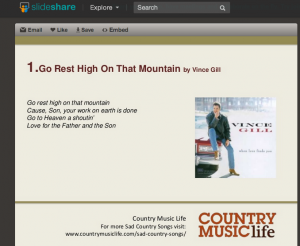 I had been seeing SlideShare results in the search results a little more often so I wanted to repurpose a popular piece of content from my website, Country Music Life, on SlideShare as a little test. We have a post on Country Music Life with a list of 50 Sad Country Songs. After the success of the post I added another post with 17 more sad country songs. Even to this day readers see that post and continue to send in their suggestions. Here is what the results page looks like for Sad Country Songs on Google. The post from CML has fluctuated between position #3 and #15 for the last few years. To repurpose the content as a test I created this slideshow on SlideShare. The result was that the slideshow on SlideShare also ranks somewhere on the first or second page on Google. Over the last few years Google seems to have focused a little more on the quality of the overall site in the results. On occasion this means that even if a single page is really good that another page of lesser quality might rank higher because that site’s overall quality is higher. SlideShare has a very good reputation in the online world. It’s managed well and has some really amazing, unique content. People visit the site like crazy because slides are a great channel for content. Google sees that people appreciate SlideShare and they represent the site accordingly. You can use sites like SlideShare, YouTube and others to your advantage. These sites have a solid reputation. A lot of business sites have solid reputations, but for many small and medium and even large businesses it’s difficult to build a reputation like a SlideShare or YouTube. So while you’re building your own site and blog you can use The Snippet Strategy using social media, but also use it by repurposing content and sharing it on sites that have a solid reputation. Create slideshows on SlideShare. Create videos on YouTube. The key is to not give away all your content. With the Sad Country Songs deck I only used half of the list from the original post. I wanted to make sure that the original post was the most thorough and worthwhile piece of content available on any channel. Use these other channels to build your brand. Content on other channels can rank well like this example, but they can also do well on social media and in other channels. Use The Snippet Strategy to your advantage. I’m sure you can even think of more ways to use it than we can.